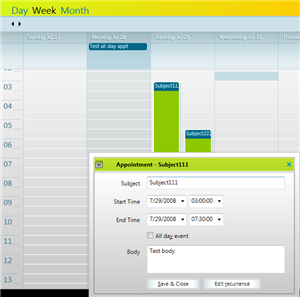 RadScheduler for WPF - want a scheduler UI on the desktop? All of the controls previewed in this build are obviously in early preview stage- thus the "Futures" build- so expect release quality to be significantly higher. Still, the early work is very impressive. Download the Futures build now (login required) to play with the new controls and then share your feedback in the forums. Do you like where we're headed with WPF?